Browse: Home » Confirmed; Bruce Stays! Good grief, what is Edens wearing! I heard this while watching the BBC local news and have to say straight off that I believe it’s the right decision for the club, if maybe not for our footy. I tried to read the statement on the OS, but of course, the site timed out. What do they use for broadband, I wonder; steam? Apart from the decision being right, I also believe it’s the moral thing to do, after the news came about that Thierry Henry had agreed to take over as manager. For what it’s worth, I believe that story was probably true. I’ve no doubt Henry had agreed in principal to take over if indeed the new majority owners decided to change manager. And I’d bet that this sort of thing happens all the time, in the background. But we don’t usually get to hear about it, as the unwritten rule is that you never discuss someone’s job while they’re still in it. Which is where I have to ask myself who leaked the story to the press? I very much doubt it would be any of the owners, as that’s just not the way sucessful people do business. So my pure guess is that it’s come from Henry’s advisor. And actually might have shot Henry’s chances in the foot, in the short term anyway. You only have to read the criticism on here and other sites about how the whole thing was just wrong. But not only is it the morally correct thing to do, it just makes sense. Bringing in a totally inexperienced manager, this late on would have been a massive mistake. And then there’s the amount of money it would cost the club to sack Bruce, which was anywhere upwards of £1.5 million, if the press are to be believed. Having thought about it, that contract payment still doesn’t make sense. Why would you have a one year rolling contract, if it involves another six months severance pay on top? That’s the whole point. After each year, the contract is looked at again and if either party is unhappy, it’s terminated. Which is quite handy for the owners, given that Bruce’s contract runs out in October. It’s gives them time to see how Bruce gets on. And if he looks to be failing, they can sack him, safe in the knowledge that Henry will probably be sat on the sidelines and they’re not seen to be totally ruthless, in bringing in an unexperienced manager, while not giving Bruce a chance. Being totally pragmatic, it’s a win-win for the club. But I genuinely hope Bruce gets us off to a flyer, as that’s all that matters. But trying to play better footy would probably help his cause too. Kodja is a bit of an enigma. From 2010 to 2016 when he signed for us he has played for a different club each season. I’m thinking he can’t be coached and that he will always be too selfish to integrate into a system. There is no doubting his natural ability and that’s what makes him even more frustrating. If Bruce can’t get him to be a team player I don’t think anyone will. It might be in the best interests of both club and player if he moves on. Get Hogan, Davis, Hepburn Murphy and Knibbs more involved this season. Is that 2-1 to us now? Two good goals from Green (I think?) especially the first one. Playing really well but how good are the opposition? Missed the first half as I thought it kicked off at 2. So a 2-1 win and we played well (for the second half anyway). No idea what the first half was like as I thought the game kicked off at 2 pm and so I missed it. Wondering if we’re beginning to see the starters for the game against Hull emerging now. Green should be one of them having scored 3 goals in two games and he looked sharp. Grealish ran the show and was as committed as I’ve ever seen him. I can only surmise that he’s going to be with us for another season as I don’t think he would have been playing today if a serious bid was in for him and he certainly wouldn’t have been throwing himself into the game like he did. Dresden only had half chances except for the one that De Laet cleared off the line. It was only after a slew of substitutions that Dresden even came close to scoring. i thought villa did well today. you can see the benefits of the system. we pressed high and this led to winning the ball back high. with the ball we are not too far away from cracking the new formation. we should be switching the ball more and got to take more care with the passes in our own half. overall i am quite happy and confident with the upcoming season, i still would like a defender and striker. taylor i was think you mean left back taylor he played and was ordinary, but i just realised you mean corey taylor he didn’t play. i was looking forward to seeing hayes who also didn’t play. Couldn’t watch the game as I’m 8 hours behind where I am so thanks for comments above. Was it the same change the team at half time tactic, or is it getting more settled line up? Green sounds promising. If he stays fit he is probably better than Adomah. They are both lightweight defensively but pose a threat going forward. Maybe Kodjia will improve with games, but he does have those issues that everyone has mentioned. Did Taylor get another run out on the right wing? He looked good last time I saw him, decent cross on him and pretty strong build as well. I guess it’s not long now before we find out how prepared we are. it was a more settled team, subs introduced around 60 mins. the players at wc which were given longer off, got more minutes. green played more central today was supporting adomah but they switched and green scored two good goals another screamer and a surprise header, from a hutton cross who had followed a brilliant run from hutton. steer made a massive error, he waited for a ball to roll slowly into the box and before he managed to pick it up a dreden player scored and had his cigar. but credit to steer he never crumbled, he made some decent saves, he also used his feet better. Villa simply have to keep Grealish. All our pre season has been with him as the playmaker. To let him go now would reck all our preparations and be negligent if the powers that be knew he was going all along. Haven’t posted for a while on here, enjoying the summer weather and trying to avoid most Villa related news. It was quite depressing up until last week! I think we have reason to be quietly optimistic. On paper we have a great side, it’s just down to Bruce now to get them performing and getting results. Keeping Grealish, Chester and Kodjia is vital, so reading Bruce’s latest interview was great news! Throw in the likes of Hourihane and Adomah as well and I think we have a great basis for another promotion push. 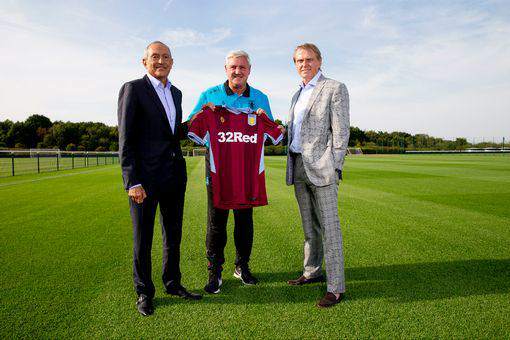 As for the manager I know many wanted Bruce out, but when you hear the likes of Grealish and Chester talking about their admiration for him they well could have jumped ship if Bruce was sacked. IMO Bruce is a lucky manager, and sometimes you need luck so to have a manager like him isn’t a bad thing in my eyes. I think one or 2 additions is definitely needed on top of the keeper from Atletico Madrid supposedly coming in, just to replace all the players who’s loans ended after the play off final. As he showed today this season could well be the making of Andre Green, fingers crossed he can stay fit. Same goes for Hepburn-Murphy, if he can shake off his torrid injury problems I’d expect him to get a run of games, he’s looked very good in his cameos up to now and I would be very surprised if he didn’t get his first goal this season. Starting to feel optimistic for the new season at last, and it’s just in time too with the new season starting next weekend! Bring it on. If you're going to gamble, please do so sensibly and only bet what you can afford to lose. Bill Pearson on Villa 2 – 1 Bristol City; It could have been six! Hitchens60 on Villa 2 – 1 Bristol City; It could have been six! Pat 57 on Villa 2 – 1 Bristol City; It could have been six! Copyright © 2019 Aston Villa News and Views.